Last Friday evening, I spent time with my friend Anna reflecting on the tech industry. We discussed local tech events, from Nottingham meetups Women in Tech Nottingham (WiT Notts) and Tech Nottingham and the recent New Adventures conference to FOSDEM, which Anna had recently returned from. Anna’s experience of these tech events varied and what struck me was how her experience of FOSDEM was different from that of the Nottingham events with regard to female and gender minority diversity within the attendees of the event. Hearing Anna’s mixed experience of these events, I started questioning whether am I biased in my understanding of women in tech? 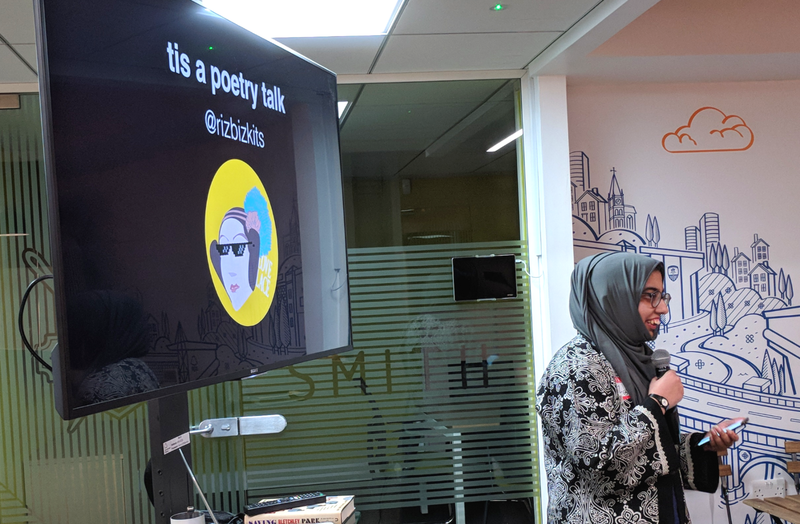 Because I co-organise WiT Notts, which we have seen grow and grow, and have been a (non-solitary) female speaker at a number of meetups and conferences over the last few years; am I seeing a more positive version of diversity at the tech events I attend than others do? The events I’ve been involved with have focused on being inclusive but inclusivity isn’t as easy as it may first appear. Initiatives such as pronoun stickers, first introduced to me via DevOpsDays London and recently used at New Adventures, are a step in the right direction. However, these stickers are not without issue. WiT Notts were very kindly given pronoun stickers from DevOpsDays London to use at our events. Whilst attendee feedback about the stickers is generally positive, I am aware that some attendees don’t pay attention to them or feel the need to wear them. We’re working on this little-by-little to help all of our attendees feel comfortable. If you’re unsure why these stickers are important, this article helps explain why everyone should include their pronoun in their profiles and at events. Inclusive initiatives aside, what else can we do to encourage women and other minorities into our industry? It’s something that we’ve been working on over the last few WiT Notts events by facilitating talks and activities that empower and build up the confidence of our attendees: female, male, non-binary or of other minorities. Last week Jess furthered this with her talk, How to talk really, really good. In it, she shared her experience of getting into speaking at events, along with some practical advice on how to get involved ourselves. Her talk was accessible and honest, she admitted to being nervous in front of a home crowd. From the feedback I received afterwards, that really resonated with people. If we’re to see a shift in diversity in tech, we need to provide speaking opportunities and create safe spaces for female and minority speakers to practice. We also need to provide role models for the next generation coming into the industry. One of my colleagues messaged before WiT Notts asking if he could bring his 14-year-old daughter. She was more than welcome. When I caught up with him the following day, I was pleased to hear she’d enjoyed the event and was inspired by so many people gathering together to support diversity in tech – an industry she is considering joining. This is why Jess’ talk was so important. We need women and other minorities to be visible in the industry, especially for young people who are deciding if it’s an industry that they want to be a part of. We’re running another Lightning Talk event in March. 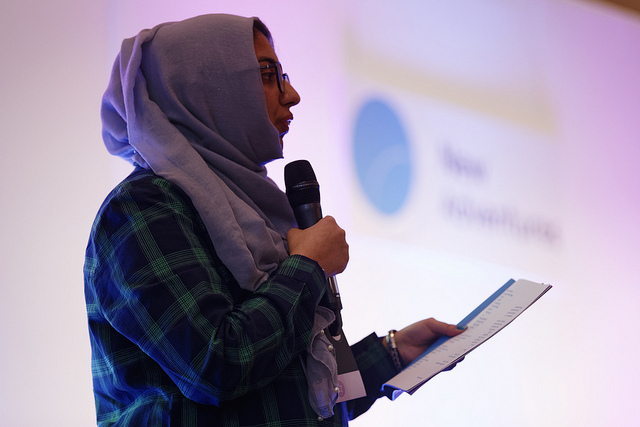 As organisers, we want to showcase a diverse mix of speakers and talks that demonstrate the expertise and passions of our attendees. Public speaking isn’t easy though. It takes a lot of confidence to speak to an audience of friends and strangers. This confidence doesn’t magically appear when you hold a microphone. I wish I could say it does, but in my experience, nerves still run high. Confidence can be gained. I have learned to relax into speaking, despite my feelings beforehand. Practice is everything – you may not be confident in your speaking ability, but if you’re confident in your material and the message you want to share, this really helps. My advice is to give it a go. Lightning talks are great as they are only five minutes long. You may find that you enjoy it. Equally, you might hate it. Both are ok, not everyone has to be a speaker. You can contribute by listening to those who speak. And more than listen, encourage. Pay attention to them, nod if you agree with what they’re saying, smile if they make eye-contact. This helps build confidence in speakers of all experience and ability. Be a friend to the speaker, even if they are a stranger. Since the time I’ve been involved with women in tech, I’ve seen our industry move forward. Perhaps not as much across the board as I had hoped but the needle is slowly moving. A year or so ago, Charlotte Jee published a list of women in the UK who could speak at your tech event. This list has recently been updated with many more speakers than the original post. We’re starting to see more women speaking at and attending tech events and conferences and this is a great thing. If we want to empower women and gender minorities, especially of the next generation, we need to be visible. They need to see us. It’s up to us to support this in whatever way feels right. Whether you are a speaker, writer, podcaster or a consumer, be visible and a part of the industry. This is how change happens. Some months ago, at Women in Tech Nottingham (WiT Notts for short), I prompted our attendees to have a paper snowball fight. Why you might ask, were we facilitating an exercise in which people hurtled scrunched up balls of paper at each other? Because it provided an opportunity for our attendees to meet and chat. As soon as snowballs were picked up and their owners found, the volume of conversation in the room rose way beyond that of previous events. My learning from this: getting people to throw things at each other’s faces is an instant way to get them talking. To give a little background to this scene, it came about from us holding a Retrospective during a previous WiT Notts event. When WiT Notts was founded, we had a bill of two speakers. Partly because this allowed double the opportunity to showcase brilliant female and gender minority speakers but also because it is the model of many tech meetups. It is hugely important to us, as organisers of the event, that it isn’t a one-way street. In order to create and maintain an inclusive event, we need to listen to our attendees to ensure it works for them. We found out that they wanted more opportunity to get to know each other and the time before and during the talks wasn’t long enough to do this. It was also apparent that, understandably, some attendees were not self-confident when it came to speaking to people they didn’t know. One of our aims has long been to help build a community of like-minded people who support and promote women and gender minorities in tech. From the Retrospective feedback, we reassessed our format and switched to a single talk followed by a facilitated session. Now, we regularly host a light-hearted networking session, such as the paper snowball fight, people bingo, guided discussions and hands-on workshops. Crayons have also featured; they were surprisingly popular. 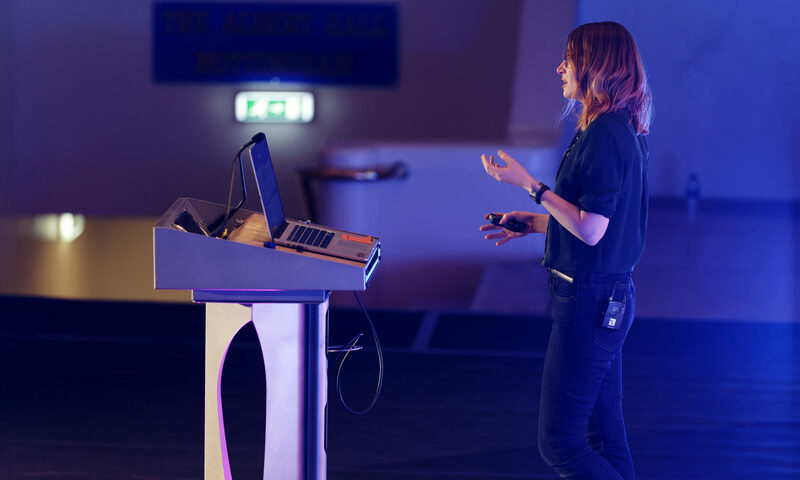 Last year we hosted our first lightning talk session which was one of my favourite WiT Notts events. We gave our attendees permission to try something new, to share something about themselves and to step outside their comfort zones. We’re now seeing the rewards of evolving WiT Notts. We’ve seen relationships form, new people welcomed and brought into conversations with our regulars and individuals’ confidences grow. Which has led me to consider, why has this been successful? Aside from making an event which is a safe space, I think comes down to permission. By allowing people to throw paper snowballs, we gave them the go-ahead to speak to each other. They were authorised to talk to a stranger, more than that, it was encouraged (but not mandatory). We all need permission throughout our day-to-day lives. Polite society wouldn’t function without it. We wait (hopefully patiently) for our coffee order to be taken, hold back until the bus driver waves us on, wait for a pause in conversation to allow us to speak. Imagine if we didn’t have this, we’d all be a bunch of degenerates. We require the consent of others, and ourselves, to help us move through life. What about online: do we consider and build permission into our digital products and services? I don’t mean native app permissions. These have their place; when well-designed they help us move through an onboarding experience, and when badly implemented make us mistrustful of the product’s intentions – why, shopping list app, do you need access to my contacts? No, I’m thinking broader than this. We don’t step into a coffee shop and state our order without being asked, that would be rude. However, I believe, we expect people using our digital products to be authoritative when interacting with our designs. We often treat our products as a one-way interaction. The person using it is in control of the direction they take through it. They act with full autonomy. In theory, this works. We want our designs to be so intuitive that people can just use them. What if it doesn’t work though? What if people lack the confidence and understanding of what they’re expected to do? If we change the way we design to be more aligned with our real, non-digital lives, what impact would that have? Rather than assuming that people want autonomy, what if we assumed, in some cases, they don’t? For a number of reasons, many people struggle with digital products and online services. A lack of confidence is one factor. In the UK there are 11.3 million adults who are classed as not fully digitally skilled. These people range from never having been online to having the means to go online but neither the inclination, confidence, or skills. As digital professionals, we’re native users of the web. Not only do we know how things work because we understand the design patterns behind them; we’re confident navigators. When things don’t make sense to us, we sigh, roll our eyes and send screenshots of poor design to our friends and colleagues (or is that just me?). We blame ill-designed systems because we know that it is the system at fault, not ourselves. If we start to picture the people using our products and services going through this thought process, how much more important is it to work guidance into our designs? By adopting a permissive attitude, can we start inviting people to interact online in ways suited to their confidence levels? Rather than expecting them to have a clear goal that they’re trying to achieve, what if we reframe it as a need? From permission grows empowerment. Perhaps with some experimentation, screen design can better support this. What if screens are not the answer? We’re starting to see a rise in adoption of voice assistants in people’s homes. Currently, this is technology that we demand things of, it’s subservient. But what if it was genuinely more conversational? What if it catered to people who lack confidence in traditional online interactions? Can we instead start crafting experiences that better mimic our day-to-day lives? A system that encourages conversation instead of instruction. A system wherein people don’t have to have a specific intention to command but can afford to be lost. Where they don’t need a goal, they can simply state their need and that need is met. We’re still in this emerging world of voice technology, machine learning and non-screen UI. I am by no means saying that this will be the answer; we need to go through many more design and research cycles to see if this is even the right direction. In the meantime, let’s think about how to give people the freedom, direction, guidance and permission to interact with our products and services in a way that is suited to them. Let’s allow them to be lost and help them to be found again. Last night we hosted our first WiT Notts lightning talks event, it was a truly fantastic evening. At WiT Notts one of our goals is to give a voice to our speakers where they might not otherwise get heard. But more than that, to create an environment where people, especially women and gender minorities, feel welcome and comfortable to share their experiences with us. There’s something kind of magical when you get a group of people to openly share with each other. The honesty of everyone’s talks, coupled with the encouragement and support of our attendees, created an atmosphere full of friendliness and inclusion. We all learned new things from each other. Some talks were of failure, mistakes made, and lessons learned. Some on knowing when to stop and understanding other people and their situations. Some about our passion for tech and our work. Some on inclusivity; on finding a place where you belong. And very passionate and animated (complete with bee impressions) talks from Emma on bees. For me, the talks couldn’t have better-illustrated women in tech: passionate women sharing their stories; honest voices admitting difficulties but not succumbing to them; advice and support to others; and emotion-driving talks that made us laugh and in some cases, hit us right in the feels. If I was looking for an example of women encouraging women, I couldn’t have hoped for a better talk than Charlie’s How to wing a presentation talk. (Definitely a woman after my own heart.) It was the final talk before the break and caused several of our attendees to get up and do an impromptu talk in the second half. Some of whom had never done public speaking before and had certainly not arrived with the intention of standing at the front of the room. I think that’s an incredible power, to encourage others to get out of their comfort zone. To say it’s ok to be nervous, it’s ok for hands to shake a bit and voices wobble. Because people aren’t judging the delivery, they’re listening to the words. That’s the important part. For an event whose other goal is promoting inclusivity, two talks really fitted this. Rizwana and Nina both delivered talks on finding a place to feel included. For Riz, it was a poetry meetup, she also performed an original poem, which was delightful. For Nina, she’d found herself in the (frankly terrifying from my perspective) world of Roller Derby. But both had the same message of discovering a place where they belonged, where they could build confidence and feel at home. And that’s my personal goal. To create an event where our attendees feel like they belong, feel welcome and supported, feel part of a thing that’s bigger than all of us. I read an article recently on how women in tech events positively impact their attendees and I hope we’re doing that too. I think we are. The thing that I love is that now we know each other a bit more. At the next event, we can ask Anna about her home automation plans, we can find out how Emma’s bees are doing, we can ask Jenny how her app project is going. It’s a platform to open up communication, community and friendship and I couldn’t be happier to be a part of that. I cherry-picked a few talks, but they were all fantastic. Thank you so much to everyone who spoke at the event. Claire Abbot: Things that are a thing! Without a doubt, Hack24 has become one of the tech event highlights of my year; its only competition being the epic Tech Nottingham Christmas parties at the NVA. This year, my fourth year, was no exception. It was, however, different as I stepped away from being an attendee and donned a red volunteer hoodie. 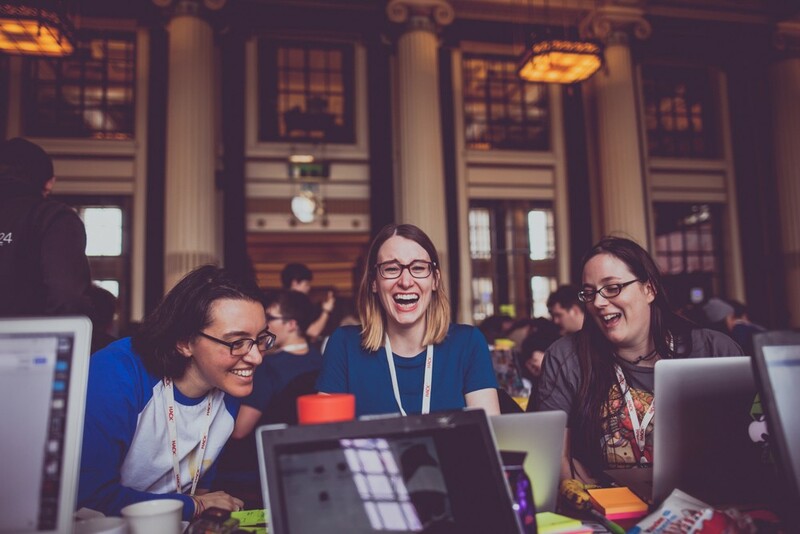 As an organiser of Women in Tech Nottingham (WiT Notts), I was very pleased to find out that, once again, we were given the opportunity to enter two teams of attendees into Hack24 2018. As tempted as I was to take a seat at the hacking table, I wanted to be able to talk to other volunteers and attendees about WiT without feeling like I was abandoning my team. I was there, though, to support them in their hacks. It shouldn’t come as a surprise that the WiT teams, Knit-Wits and WiT Happens, worked amazingly well together. This year we had a great mix of UX, front-end, back-end, full-stack, and ops – across a range of ages. Some members of the teams knew each other before the event, some knew each other vaguely from WiT Notts, but both teams didn’t know each other properly until ten days before the event. It didn’t show. The level of teamwork, friendship, support and laughter coming from the WiT team tables was wonderful to see and it was so much fun hanging out with them. 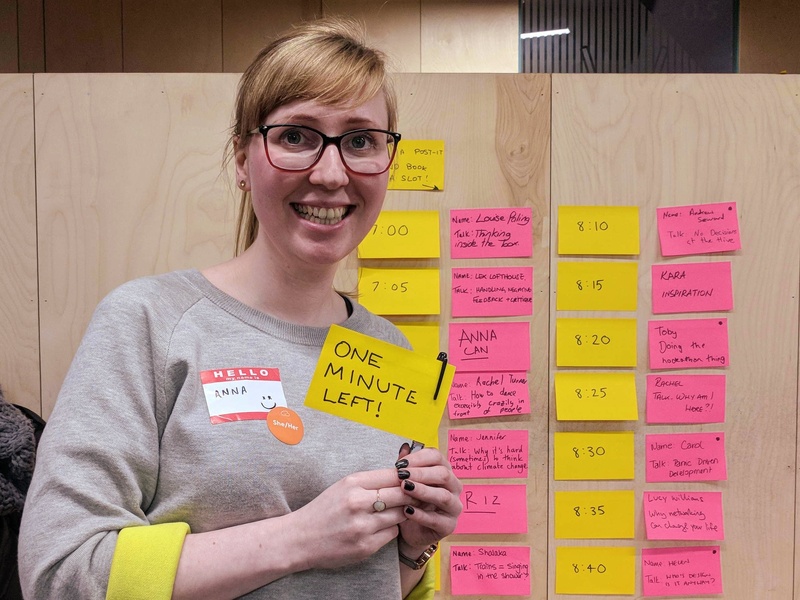 Often during a WiT Notts event I have to keep one eye on the time, food, social media, or looking after speakers, so I don’t get to spend as much time talking to our attendees as I would like. Spending time with these lovely ladies was a great treat. I’m delighted that our WiT teams did so well. Not only were they the poster-child for teamwork, but one of our teams, the Knit-WiTs, won two of the challenges: The Thomson Reuters Do Good with Data and the MHR Easter Egg Hunt. Seeing a team of women who didn’t know each other well, creating an entry that solved a real issue for women made me extremely proud. The Knit-Wits entry was an app that people could use report misogyny. Nottinghamshire police were the first in the country to enable misogyny to be reported as a hate crime, but the process is not made easy for victims. You be Brave, is an app designed to report harassment and abuse and capture the data. Check out the team’s entry video to see how the app works. With only 1 in 4 women working in tech, having our attendees do so well in front of an audience of 200ish people, was absolutely fantastic. They are all superstars. I’m grateful and humbled to be involved in heading up WiT in Nottingham. It’s a role I fell into rather than designed and it’s because I felt the need to be involved in giving female and gender minority speakers and attendees more prominence in the industry. There’s a long way still to go, but being represented at notable events like Hack24 is a really great thing. In addition to the outstanding work of the WiT teams, the thing that makes me most proud to be a part of Hack24 is the collaboration and teamwork that it inspires in everyone. Andrew introduced the event with “There’s no such thing as an outsider at Hack24” and it’s true. I couldn’t wish for a more inclusive event. Having hung around the Nottingham tech scene for a few years, and being an organiser of WiT, year-on-year I get to know more Hack24 attendees. (I literally knew two people in year one.) Volunteering was an opportunity to spend time with good friends and make new ones. The volunteers were all such lovely folk. I knew some vaguely, but spending hours with them has cemented them from wave across the room, to a full-on catch up the next time I see them. If you’ve been to Hack24, you’ll know that it’s a rollercoaster of emotions. There’s palpable excitement, frustration when things go wrong (spoiler: things in hacks always go wrong), tiredness, late night ‘we’re all going a bit delirious’ silliness and more. It was fantastic to be a part of this. All of this fun, friendship and collaboration would not be possible without the hard work and dedication of Andrew and Emma. They are the most selfless people I know and their input into the tech community in Nottingham has touched so many lives. Meeting them has had a profound impact on me. 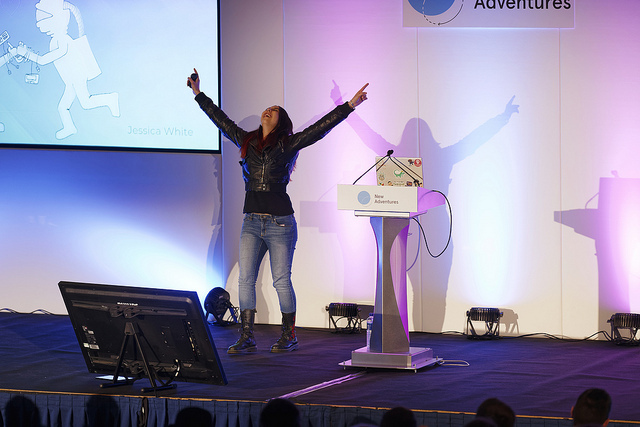 Through attending Hack24 in 2015 and starting to go to Tech Nottingham I have made an amazing group of life-long friends; learned how to be a speaker; landed a dream job; gained confidence; and ended up as an advocate for women in tech. My life is richer for knowing them and I will be forever grateful to them for being the incredible positive influencers they are. If you’re not involved in the tech scene in Nottingham, then I urge you to get involved. There really is an event for everyone, find yours at nottingham.digital. A little less than two years ago, I was at my first ever hack event; Hack24. As a designer rather than a developer, I was a little uncertain about whether I had a place there but thought it sounded interesting so I’d give it a try. To my team’s utter surprise, we won the Broadway challenge and thus became the ‘Superteam’. Unbeknownst to me at the time, there was another woman there who I would go on to co-organise Women in Tech Nottingham with. Jess (who is awesome!) tells me that she had been coding for only a couple of months before her first Hack24 so, it seems, we were both finding our feet in the world of tech. And who better to help us with that than Emma and Andrew, directors and organisers of Tech Nottingham and Hack24. The second I walked into the registration area of that first Hack24 event, I was met with a huge, welcoming smile from Emma, who is sunshine personified, and felt that she was someone I needed in my life immediately. In that first Hack24, the majority of the hackers were male. Aside from Jess and myself, there were seven other female hackers out of around 130 (if Andrew has given me the correct numbers). Even though the number of female hackers was low, my team and hacker Kate both co-won the Broadway challenge, which felt pretty darn good. Fast forward to Hack24, 2017 and we have our first ever WiT Notts all-female teams. So how did we get on, I hear you ask? Well… we rocked it! Our team, Totally Triumphant Bodacious Babes (yes, we use Bill and Ted references a lot at WiT Notts) came runner up in Cronofy’s Let’s Rendezvous challenge. The prize was a model Delorean, which fits in nicely with our love of 80s/90s movies. Team Hey Pesto won TWO challenges: Esendex’s Connect with Gen Z without inducing zzzzzz… and Packed Pixel’s Best Hardware Hack. In addition to the two WiT Notts teams, two of our regular attendees were part of a team who won UNiDAYS’ Implement a song title challenge. Most of the WiT Notts folks were first-time hackers at Hack24 so to win so many prizes was joyous. 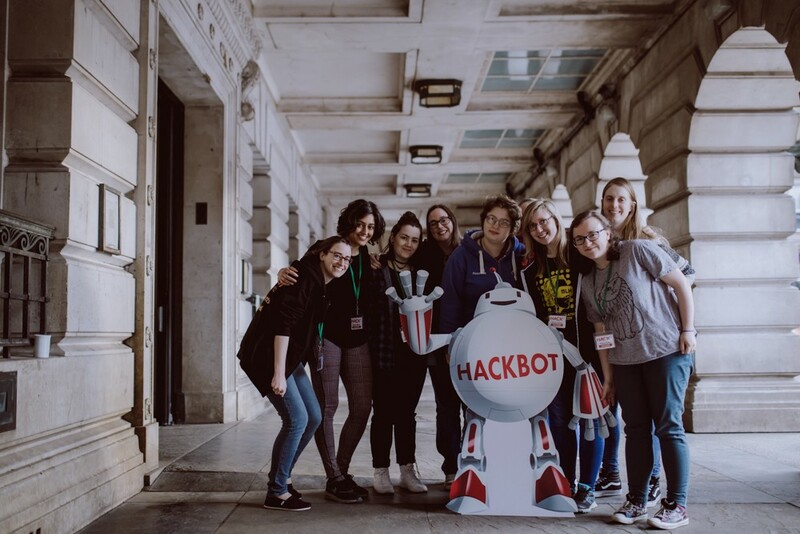 I’m looking forward to seeing even more women at Hack24, 2018 being brilliant and winning challenges! I cannot begin to describe how proud I am to have worked alongside such an amazing group of ladies. Our motto at WiT Notts is ‘Be excellent to each other’. Although this is a most outstanding movie reference, it is not glib. Being excellent to each other is about collaboration and communication. We spent the weekend encouraging, supporting and entertaining each other. In the WiT Notts teams, everyone had their own skill-set but when these came together, we really did become more than the sum of our parts. And that’s why WiT Notts exists for now. To get women, and men, together to build a community, encourage more female speakers and to get more women at tech events such as Hack24. Jess and I always introduce our event by saying that the ultimate goal is for us to become redundant. Our work is done once there is more female representation and participation in the industry. But until that day, we’ll keep being excellent to each other and party on. Huge shout out to the WiT Notts teams: Jess, Elsa and Laura; Amy, Bety, Alexa and Saria. And to WiT Nott’s attendees Samathy, Lex and Anna for being a huge part of Hack24 — you ladies rock!